This article is about the island in the Sea of Okhotsk. For the island in the Sea of Japan, see Reyneke Island. 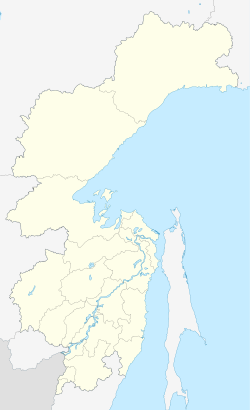 Reyneke Island (Russian: Остров Рейнеке; Ostrov Reyneke) is an island in the Sea of Okhotsk, administratively part of Khabarovsk Krai, Russia. The uninhabited island lies 45 kilometres (28 miles) to the south-east of Menshikov Island, and has an area of approximately 7 kilometres (4.3 miles) in length and a maximum width of 1.6 kilometres (0.99 miles). It is a mountainous island located close to a headland of the continental shore, separated from mainland Khabarovsk Krai by a 45 kilometres (28 miles) wide sound. Reyneke Island was named after Mikhail Reyneke, Vice Admiral of the Imperial Russian Navy and an early hydrographer of the Russian Hydrographic Service in the region. This page was last edited on 9 November 2017, at 22:20 (UTC).